Would you like to sit at a bench with Skip Morris and tie flies with him? Would you like to ask Skip's advice on making cleaner thread-heads, neater hair wings, easier and better-looking parachute hackles, while Skip demonstrates, explains, and guides you as you tie together? 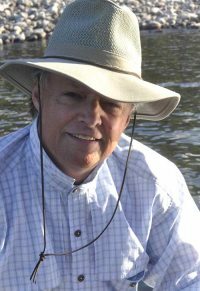 Skip will give fly tying lessons with individuals up to groups of four. Beverages will be provided. A deposit of half down will be required, refundable in full up to two weeks prior to the lesson (or lessons) and non-refundable within two weeks of the lesson (which means you'll probably donate half the lesson or the whole lesson to a fly-tying friend). Skip will ask you questions about what you want to do beforehand so that he can personalize your lesson. If you have certain flies or techniques you want to work on with him, no problem. If you just want to tie some of his fly dressings with him and keep things casual, he'll do that, too. This year, we are currently booking lessons locally (in the Puget Sound area), and in whatever area Skip is giving a talk or a clinic. Check out Skip's "Appearances" page to see if and when he will be in your area. to set up your tying lessons with Skip!